Sorbet. Sounds fancy. Its not. Its fruit, a bit of sugar, and maybe a little extra flavoring. That’s it. Simple, bright, and refreshing. 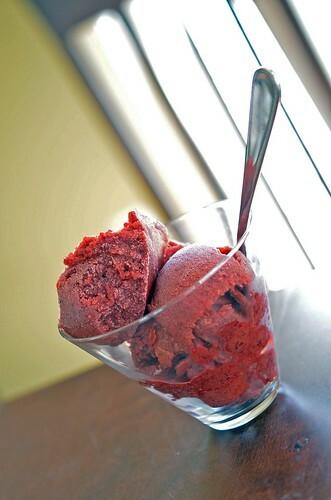 I am slightly addicted to Whole Fruit sorbet. Their mango, rasberry, and strawberry – all worth writing home about. Their single serving deals even include a spoon, stuck in the lid. Handy. However, they are expensive and its not even a full pint any longer. This annoys me…I’d rather pay more and get the full pint, instead of paying the same and not being told its less product. Sneaky. I don’t like sneaky. With a quick glance at the ingredients…sugar, fruit, flavoring – why couldn’t I make my own? So I did. I had sweet cherries in my freezer ( I like frozen fruit as a snack), whipped up some simple syrup, juiced and zested a lime. 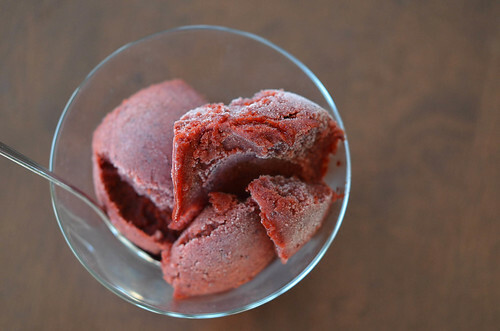 Tossed it all in a blender – gave it a whir, and voila – sorbet. Well kinda, I tossed it into my ice cream maker to get it frozen quickly, but it wasn’t necessary. 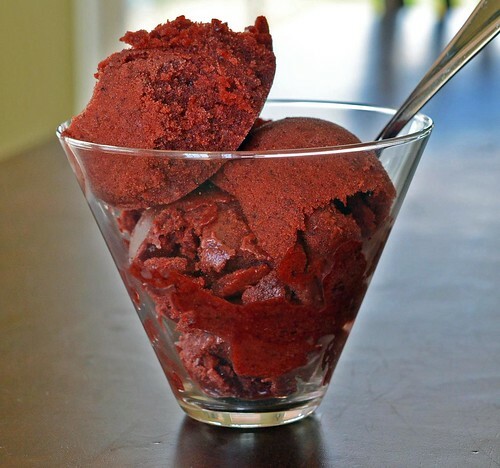 I could have stuck in the freezer straight from the blender and waited until it was frozen, but being impatient when it comes to frozen treats…I used my ice cream maker. Instant gratification is nice sometimes. 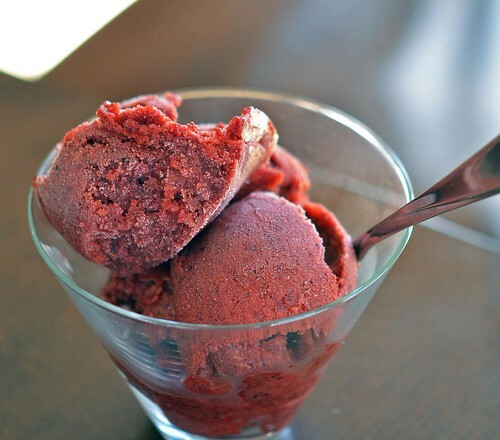 I bet this would be really good with champagne, prosecco, or moscato poured over the sorbet…wine slushy anyone? Glorious. Simple Syrup : In small saucepan combine 1/2 cup sugar and 1/2 cup water. Place over medium heat and cook until sugar dissolves. Stir occasionally. Remove from heat and let cool to room temperature before using. Tip: Make more than 1/2 cup, store in fridge in sealed container and use in iced tea, lemonade, or mojitos…just saying. 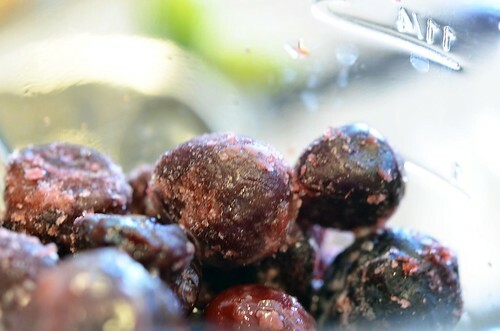 If using fresh, unfrozen cherries then a ice cream maker will be necessary.